It’s taken a while, but it looks like full mobile coverage in the City Loop is imminent. It’s been available in the stations since about 2000, but the signal generally cuts out as the trains enter the tunnels. There are four separate Loop tunnels. For months people have reported the signal being available in one or more of the four tunnels, only for it to disappear again the next day. It appears to have been undergoing extensive testing, including verifying that phone signals didn’t interfere with train driver radio signals. Yesterday morning there was a strong uninterrupted Telstra 4G signal all the way from Richmond through to Flagstaff on the Caulfield Loop. Others reported similar experiences in the other tunnels. Yesterday evening I found the signal to be a lot more patchy. 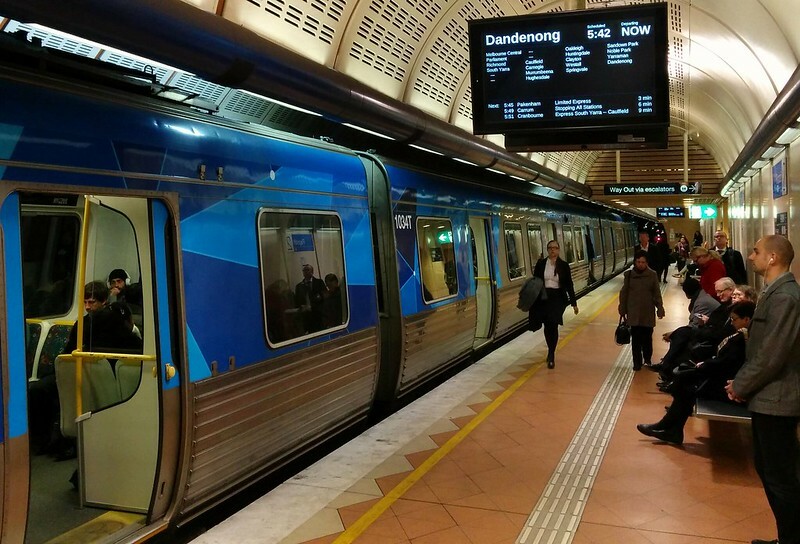 It was good between Flagstaff and Melbourne Central, but then cut out along the line to Parliament, and was patchy again between there and exiting the Loop near Richmond. But it does seem to be progress. There are plenty of other mobile blackspots on the rail network. On my commute, the section between South Yarra and Malvern is notorious — parts of it are slightly below street level, which probably doesn’t help, but the biggest problem isn’t the signal strength, it’s the network capacity. It slows to a crawl if you pass through on a packed train, but outside peak hour seems fine. There’s another dodgy spot between Glenhuntly and Ormond, which is well above street level. Hopefully mobile coverage can be maintained at locations which are being moved underground as the level crossing grade separations are implemented. V/Line commuter routes also suffer from numerous blackspots, despite a government pledge last year to solve them. It’s since been estimated that up to 40% of V/Line routes don’t have mobile coverage, making it a big task… and yet something that has largely been resolved along the main highways. The benefits of Loop coverage are obvious: phone and data coverage means the productive time spent on the train doesn’t have to stop when you reach the City Loop, and also mean good access to realtime travel updates while on the move. Hopefully it will be officially switched on soon. Of course, the downside is that any loudmouths on the phone will no longer be cut-off as the train goes into the tunnel. But that’s a broader problem. Update 7pm: Channel 9 liked this story so much they decided to report on it using a live cross transmitted by mobile from a train in the Loop. Update Thursday: It’s now officially on. “productive time spent on the train” versus “loudmouths on the phone”. To sit next to someone who is using hands free phone, 10cm from your ear, yelling about their hysterectomy makes for a long journey home. Hopefully after this we might get some coverage at Knox. Congestion on Telstra 3G/4G network is a problem on peak PM express trains every day, all the way from South Yarra to Cheltenham. You’d think it would be pretty easy to establish and maintain a network with sufficient capacity for ~1000 people on a train moving along a fixed linear corridor, at 5-7 minute headways. But apparently not. @Daniel, yes, as well as the hysterectomy, the woman described a haematoma that was caused by the procedure. I’m sure the whole carriage was riveted. PS, letter in today’s Age from Chris Davis: “Oh no, that loud phone call annoying the whole carriage will no longer drop out in the city loop.” Couldn’t agree more with him/her! Most of the towers along the way would be at a high for usage for the day and that makes it harder. There are also lots of people on trams in the South Yarra-Gelnhuntly section of that trip and the motorists, their passengers and bus passengers as well. There also would be a high in static and walking phone users at that time as well. This all puts the system under pressure. Full 4G tonight from Parliament to Jolimint.